Now you can protect your garden, chickens, and pets from unwanted intruders like foxes, opossums, gophers and other predators the brand new 3' x 50' 1/4 in 23 gauge Hardware Cloth Galvanized Cage Wire. The small 1/4" opening is big enough to keep a constant airflow and will not constrain sight but also small enough to keep out intruders and keep in even the smallest of chicks in. The 23 gauge wire is strong enough to maintain virtually any shape but malleable enough to be able to mold with ease. It has also been galvanized to help protect against rusting. Perfect to make chicken coops, protective fencing for your garden, dog fencing, compost bins and many more applications. This is also perfect for arts and crafts. Use is as a base for large or small paper mache sculptures,perfect for the rustic picture frames, great for wall planters, or make funky lamp shades, the applications are limitless. You can use this wire to get that rustic country decor to hip artisanal look and even fine art. VERSATILE & MULTI-PURPOSE: The wire mesh can be cut with tin snips and shaped for specific projects in a home or on a property, including coverings for window and screen doors, chicken run, rabbit fence, tree guards, drains, gutters, under eaves, soil sifters, and much more. MATERIAL & SIZE: 23 gauge, heavy duty hot dipped galvanized hardware cloth, providing a zinc coating for maximum rust resistance and long life, measures 3X50 ft approximately, cut easily with scissors. Molded or folded as needed without any problems. 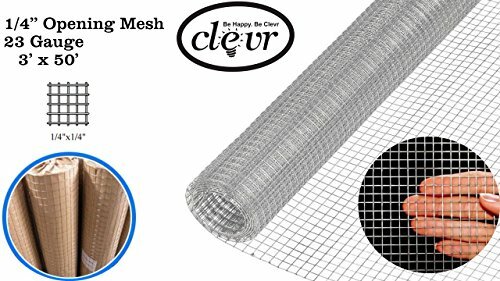 The 1/4-inch mesh roll is flexible and tight enough to keep small creatures out. ARTS AND CRAFTS: Perfect for arts and crafts. Use is as a base for paper mache sculptures, perfect for the rustic picture frames, great for wall planters, or make funky lamp shades. You can use this wire for rustic country decor or to get that hip artisanal look and even fine art.